The Ugly Christmas Sweater: funny. The Ugly Christmas House: not funny. If your past attempts at holiday decorating has given you the blues, we’ve got some tips for you. Though we don’t guarantee that this will turn the exterior of your home into a winter wonderland worthy of completing with the views from the top of Bachelor, we do think it will help you create a holiday look that is uniquely Central Oregon and exclusively you! Search the Internet or places like Instagram and Pinterest to find homes of similar size and styling and implement their design into your own holiday decor. Deduce from these examples why you like the design: where did they put the lights? What size and color did they use? What colors work with the color of your house? You don't have to be a designer to copy designer style. Be true to your architecture. Holiday decorating of a Frank Lloyd Wright-spired home versus a rustic cabin should be dramatically different. Don't force the exterior of you home to comply with decorations that just don't fit it. Modern homes look great in colored strips of bright light, while older, historical homes do well with large, traditional white lights and gorgeous evergreen accents. You can be creative and true to your home's architecture at the same time. Treat the inside with the same principles of the inside. When you have a spectacular view and gorgeous outdoor furniture, these spaces make for an extension of your home all year round. Don't forget to give your porch and patio a dusting of holiday spirit. A nice plaid or red outdoor blanket, a fire pit with festive media, and a hot cocoa bar all turn your outdoor space into Santa's backyard. Decorate with items generally found outdoors. 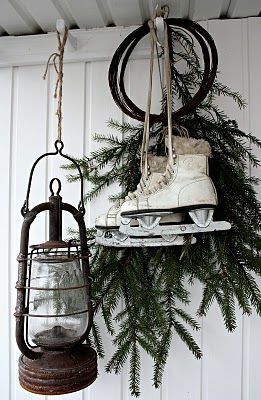 A great way to get a festive outdoor look is to use items that inherently go with the outdoors such as swags of Douglas Fir, wreaths, sleds, sleighs, wagons, laterns and skis (we know you must have a few of those lying around). Staging these items in a festive outdoor display gives your home a holiday touch minus the cheesy factor. Successful decorating of you outdoor space should elevate the beauty of your home and patio, keeping it professional looking, true to the architecture, warming up the space and giving it a festive--yet subtle--holiday touch.